As is customary with early book releases, there are a few bugs that made it through the rigorous testing procedures for which Fforde books have not become legendary. The following instructions allow you to update your edition to an all new V1.1. 1: Editions covered by this upgrade: All NEL hardback and softback editions. ON NO ACCOUNT attempt to upgrade any advanced Readers copies or US editions; a 'deep text crash' may result which will render your book unreadable and may well wipe out all the planet's fiction. 2: Earth the book by touching it lightly against a dictionary. 3: If you are running your library on the outdated SCROLL V7.3 or PAPYRUS 2.8, please upgrade immediately to BOOK 7.3 which is available by downloading HERE and is now bundled with PageGlow™ and AutoPageTurnDeluxe™ at no extra cost. 4: If you are running the Beta Version of BOOK V9 or "SUPERTEXT™" as it is known and have Anti-GrammasitePro™ or ReadZip™ activated, please disable before upgrade. Third party hardware ancillaries such as bookmarks, pressed flowers, old bus tickets, prophylactics, etc, must also be removed. Hallo Mr. Fforde, just reading Lost in... Tunbridge Wells - Bochkamost (not Botchkamos) Istochnik. "Most" is bridge in Russian, Slovak and Czech. if there is "ch" in "istochnik", there must be "ch" in "bochka" it is the very same letter in both words when written in Russian. 6: Go to page 14 and replace 'NetworkMole' with 'NetworkToad' - Small typo but if allowed to remain could distort tense of past participles in surrounding paragraphs. 8: Go to page 41 and respell 'neanderthalis' to 'neanderthalensis' This is of vital importance as a mispeling vyrus, once allowed a small toehold, can run though an entire book like a forest fire. 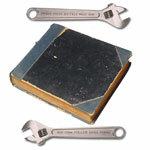 If you don't beleive me, have a look at the 'Molesworth' books by Willans and Searle. From one uncorrected spelling mistake, the whole series is badly infected. Passed off as 'intentional', Jurisfiction have left it as a warning to what happens. You have been warned. 9: Go to page 123 and wherever it says 'bat' change to 'paddle'. There was an enormous four-person demonstration outside where they thought I lived by members of the League of Table-Tennisers. (Motto: "call it ping-pong and you die") Calling a paddle a bat is like calling an oar a paddle in rowing (or is it sculling? ), so apologies all round. 10: Wherever you find it, take out 'Nakijima' and replace it with 'Nakajima' Sharp-eyed copyeditor pointed this one out. US edition will be Nakajima compliant. Nakajima is a common name in Japan, wheras 'Nakijima' is about as common in Japan as 'Smitth' is here. It is also the name of a Japanese aircraft manufacturer, which was why I chose it. 11: Go to page 150 and change 'Sydney' to 'Tokyo' in the sentence: '..then to New York, DeepDrop to Sydney and finally another overmantle to Auckland.' As we find out on the following pages, Thursday drops from London to Sydney; the New York DeepDrop only goes to Tokyo. "so I could have brought in a fleet of Harrier jump jets and the entire Ringling brother's circus and no-one would be any the wiser"
"so I could have brought in a squadron of Hurricanes and the entire Ringling brother's circus and no-one would be any the wiser" Jet engines, unfortunately, do not exist in Thursday's world. At the time that Miss Havisham made this comment, she wasn't aware of the fact. 13:When you have finished the corrections reactivate the book by closing it and then turning it cover uppermost. 14: Congratulations! You are now the proud owner of Lost in a Good Book V1.1. To fully authenticate your copy download the upgrade sticker file by clicking HERE. Print out the download and affix it to the title page of your copy. 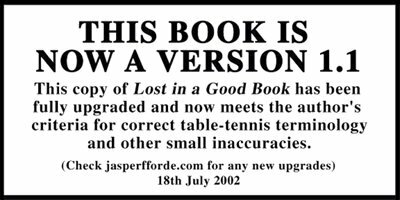 Thank you for using the jasperfforde.com upgrade service.